This month's issue of League City Connection features a full page write up on Mendel Cotlar, OBM, and the JLI Gratitude Seminars held in his memory at Chabad Bay Area and around the world. 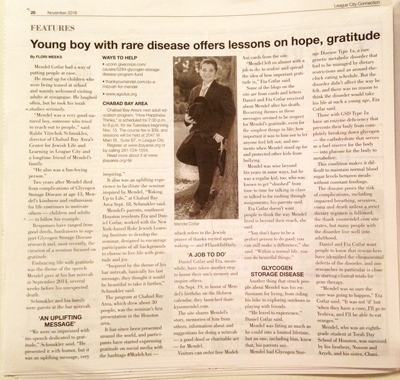 "Young boy with rare disease offers lessons in hope and gratitude"
Monday Eve: Simchat Torah & Sushi! Join us for a lively, one-of-a-kind, Simchat Torah celebration. • Dance with Torah Scrolls and Dine on Sushi Rolls (and more)! 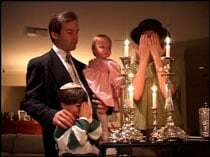 Tuesday Morning: Conclusion & Start of Torah! Watch your mailbox this week for the Bay Area Jewish Calendar 5777 (2016-2017)! Join us for a traditional service enhanced by beautiful Chassidic melodies, interesting insights into the prayers and a brief discussion on the weekly Torah portion. A light Kiddush lunch follows the service. Please note: You are welcome to arrive and leave at your convenience and at any time. Dinner Under the Stars - Sunday night! Just a few seats left for Dinner Under the Stars on Sunday night. Please reserve as soon as possible! If possible, please park at Chabad Bay Area parking lot. The Sukkah is at the rabbi's house, a short 5 minute walk from the center. Home address & directions will be emailed to reserved guests. Monday & Tuesday (Oct 17-18), between 4 and 6 pm (just pop in). Wednesday or Thursday (call 281-724-1554 to schedule). 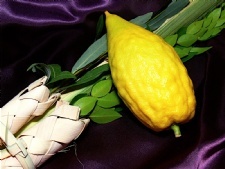 Wouldn't it be nice to have your very own Lulav & Etrog (The 4 species: Palm, Citron, Myrtle and Willow) this Sukkot? We are pleased to make this service available to you. We'll be ordering good quality kosher sets, grown in Israel from original heirloom etrogim of the famed Calabria, Italy stock. Cost: Good Kosher Set: $54 | Premium Quality Set: $75. To order, please use our Event Reservation form and select 'Lulav & Etrog Order'. NOTE: Your Lulav and Etrog will be available for pickup from the rabbi's house on Sunday, Oct 16th (Sukkot begins that evening). Please consider including Chabad of the Bay Area in your holiday charitable giving. It is with your partnership that we are able to offer warm & welcoming opportunities for Jewish living, learning and celebration to everyone. Thank you very much! In the merit of your generous Tzedakah may G-d Bless you and yours with a good, sweet, healthy, happy and prosperous year!